A financial year splits transaction records into period of 12 months. You can specify start and end date of the financial year depending on your country. To create or modify financial year information, go to Setup menu and click Financial year menu. For each financial year, you will need to specify a name. This name will be displayed in status bar and for your reference only. Each year will have a start and end date and current status. By default, the financial year is open. It means you can record transactions for the year. If the financial year is closed then you will not be able to save records like invoices, quotations, receipts etc. The from date and to date should be specified as per the standard method in your country. For some countries, it starts in October, for some countries, it starts in April. So you can choose the start date. The financial year information can also be specified when you run the software for first time. 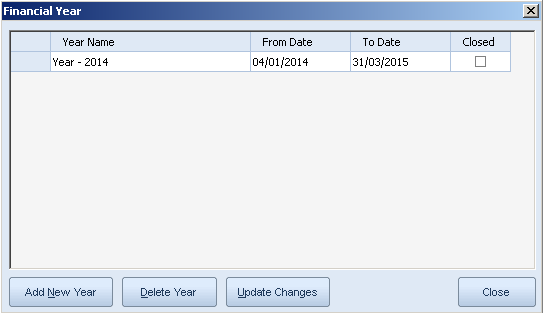 The first run wizard will prompt you to specify the year details including name, from date and to date. It will by default pick up the from and to date depending on the selected country.